Friday is the “weekend” in Muslim countries. Thursday afternoons people (who have jobs) tend to leave early. This Thursday our IMF team scheduled no outside meetings in order to work in the Guesthouse on drafting our report. Around 2:00 pm I decided to stop fighting my drowsiness and take a short nap. As I was about to stretch out on my bed, I heard a loudspeaker announce: “Duck and cover, duck and cover. Stay away from windows” which was repeated several times. I was too sleeping not to nap but decided to lie down on the floor next to the bed so as to be out of sight of the window, which in any event has shatter proof glass. I had invited Scott Brown, now with USAID here in Kabul, for dinner at the Guesthouse for Thursday evening. Scott and I had first met in Sarajevo, Bosnia and Herzegovina in 1996. We had both worked in Kosovo and Iraq as IMF staff as well. When the Canal Hotel (UN headquarters) in Baghdad was bombed in 2003, which started the deterioration of security in Iraq, Scott was seriously injured and largely lost the use of one of his arms. During dinner I mentioned the Duck and Cover announcement during the afternoon and he explained that it was the weekly practice drill at the U.S. Embassy (a few blocks away). Today, Friday, is a beautiful sunny day. 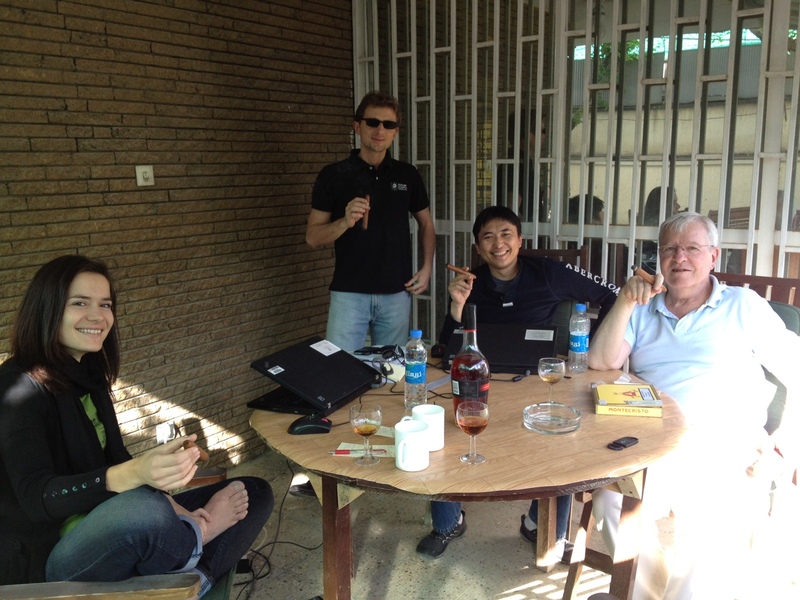 I was able to take an afternoon break from our work to sit out in the yard and smoke one of the Cuban cigars given to me by the Swiss National Bank (SNB) the previous week following a twenty year anniversary of the Swiss membership in the IMF and participation in its technical assistance program. The SNB’s first undertaking with IMF technical assistance was my mission to Kyrgyzstan and the National Bank of the Kyrgyz Republic in 1992. I was join for cigars by three other members of our team before we returned to the drafting of our report, suspending our work at midnight until tomorrow morning (good night). This entry was posted in Afghanistan, Travel and tagged Afghanistan, cigar, IMF, Kabul. Bookmark the permalink.